My friend Alex gave me a dozen fresh eggs from her backyard chickens after coming over for drinks one night. The next day I bought smokey bacon from Cornerstone Farm at the Portland Maine Farmers Market with Sunday breakfast in mind. I just needed a bread worthy of the other ingredients. When I moved to the US from the UK over ten years ago I was a little startled by how most bread tasted sweeter than the bread I was used to. I got on and dealt with it (sweeter bread isn’t really the end of the world right?) and then we moved to Maine and I discovered Big Sky Bread Company out of Portland, Maine. The first time I picked up a loaf of their English muffin bread I was a little skeptical. Would it really possible to take the wonders of an English muffin with the nooks and crannies just waiting to be anointed with fresh butter and make it into a sliced loaf? You can rest easy because it IS possible. Run, don’t walk to buy your own loaf of Big Sky Bread (I buy mine at The Good Life Market in Raymond, ME but you can also get it directly from the bakery on Deering Ave, at Market House in Monument Sq and at Whole Foods. You’ll carefully take out a slice and might be surprised at it’s heft and slight tacky feel. Pop that baby in the toaster, spread generously with fresh butter and you’ll be ruined for any other toast forever. If Paul is traveling I’ve been known to eat Big Sky toast for breakfast, lunch and dinner it’s so good. 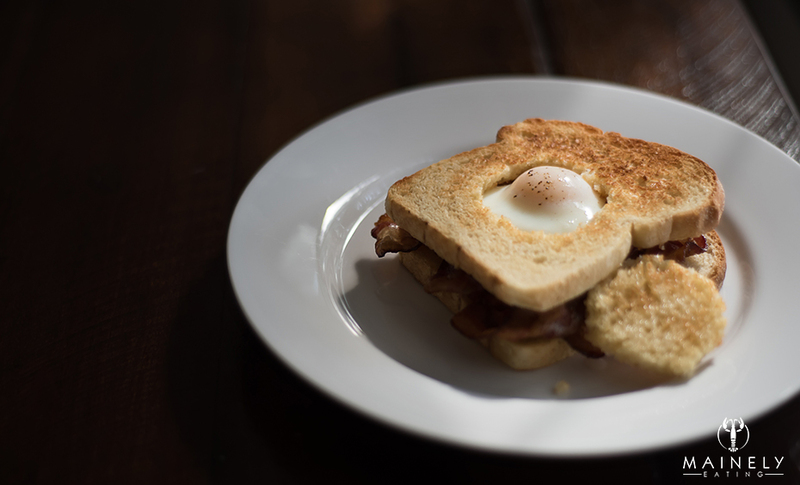 So back to the breakfast sandwiches, I fried up the smokey bacon until crispy, gently poached the day-old eggs, toasted the English muffin bread and we ate under the pine trees on the patio listening to the loons out on the lake. It was the perfect Sunday morning.